Do you remember the good old days when we were growing up as young children and the most engrossing part of the day used to be when we sat around our grandparents to hear fascinating stories, and fairy tales? Those were the days before TV, internet, playstations and mobile phones took over our life and children started spending their time watching animated movies and cartoons. Although it is widely acclaimed by child psychologists and educationalists that stories are among the best ways to educate young ones at impressionable age and they recommend including those in the curriculum as part of a pedagogical process. However, in practice it rarely happens in most of the schools today. 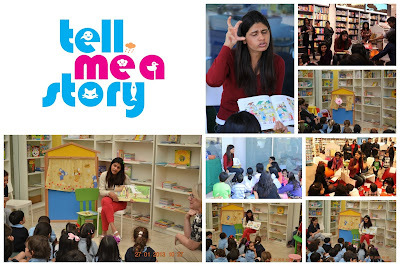 This very thought germinated an idea in our today’s guest Ms. Veena Gandhi, who changed the way children read in Dubai through her storytelling program (the one and only of it's kind), 'Tell Me A Story'. 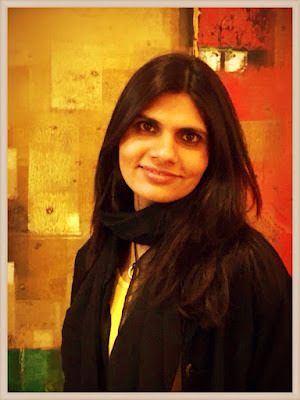 She was so much fascinated by the boundless possibilities of storytelling that Veena gave up her corporate career to spend time with children, including her son and re-invent herself as a top-notch Story teller. 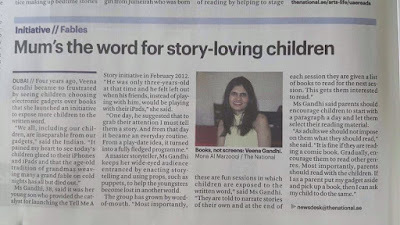 After having started the concept of Storytelling to schools in Dubai and getting it adopted in many schools, Ms. Gandhi started a variant of the same in Australia and became one of the few Indians to speak at Melbourne's Emerging Writers Festival, and currently in the final stages of launching a children's book written by her. 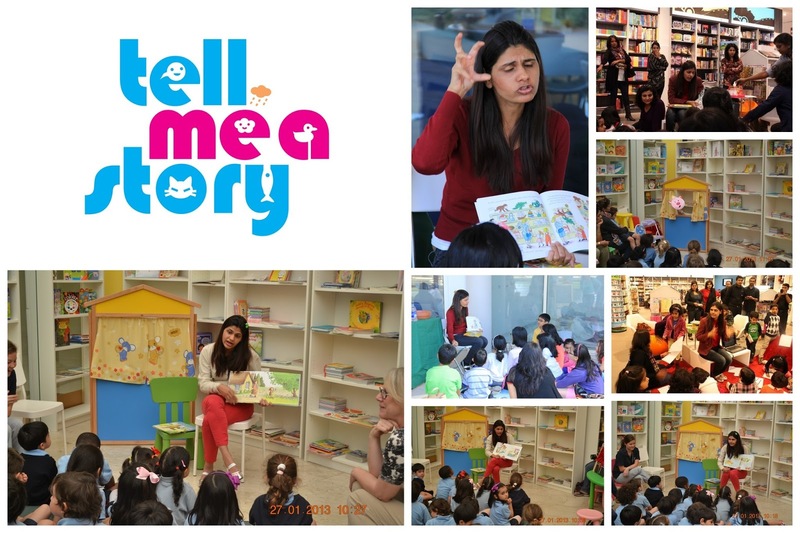 Here are the snippets of our interaction with Ms. Veena – a storyteller, a writer, a speaker, who shares with us her wonderful journey about this. 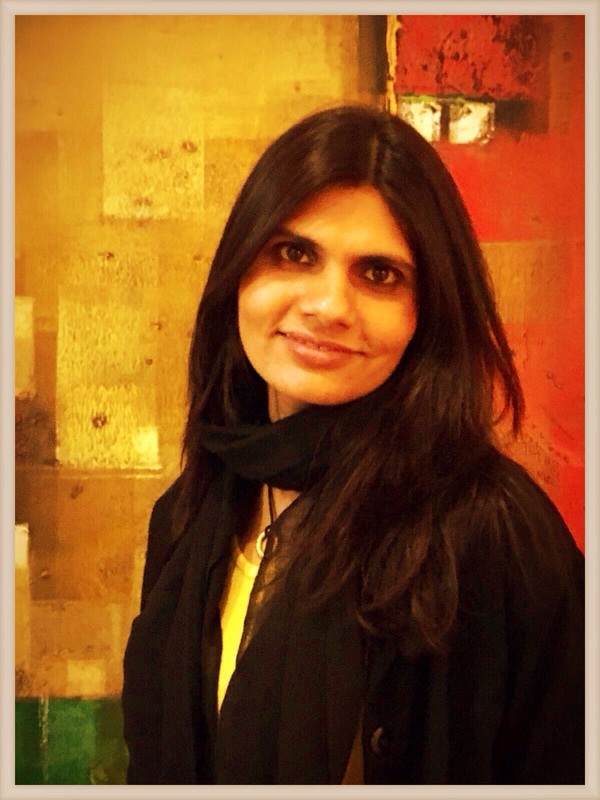 I was born and brought up in a typical Punjabi business family in Delhi. My late father had always encouraged us to speak out (and speak out loudly!) our mind. After completing my graduation in English Literature from Hindu College, I pursued my Mass Communication from MCRC, Jamia. Then I ventured into a career in advertising. After approximately 8 years in top-notch advertising agencies, we moved to Dubai. My son was around three years old at this time. I had had enough of late hours and creative tantrums (laughs!). I wanted to use my skills for something more challenging than just chasing client deadlines. Thus was born my second baby, in Dubai, 'Tell Me A Story' . This was a story-telling program for children from new-born (yes!) to 8 year olds. It was first of it's kind. In most parts of the world you have a lot of storytelling sessions in the libraries or parks. But in Dubai these were next to nothing. I used to feel horrible, looking at kids glued to their screens. I started from a session in my apartment and went on to tie-up with book stores, schools and Emirates Literary Festival and Sharjah International Book Fair. I started from a Facebook page (https://www.facebook.com/Tell-me-a-story-314217402013055/) . No website, no marketing just word-of-mouth. 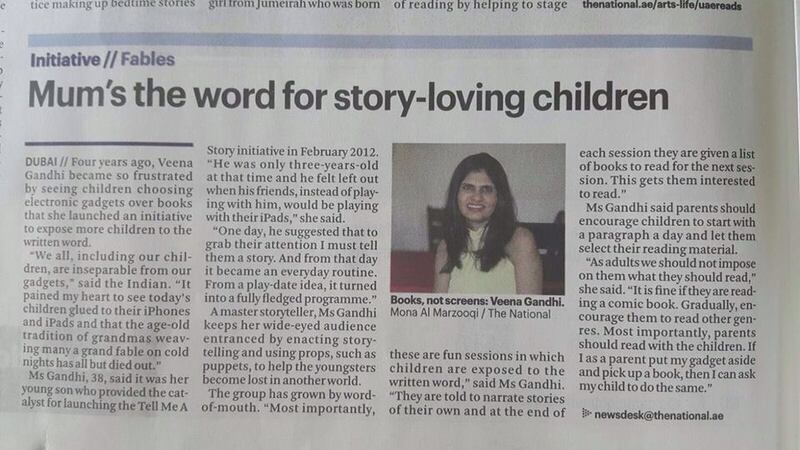 The UAE media loved the idea of 'Tell Me A Story', and covered the sessions quite a few times. It's a very unique and kind of unheard of journey from a corporate life to storytelling. How did you bridge the gap of quitting it all for a venture you had no experience in? I always take life as it comes. Initially, it wasn't easy for me to give up corporate life, and venture into this. But spending time with my son and then seeing the children glued to screens, it really appeared to me as the "need of the day" to bring the children back to traditional ways of teaching through stories. This sense of need kept driving me to this. What are the challenges you face in setting-up your own venture? You spoke about a the meaning of 'home' at the Emerging Writer's Festival in Melbourne recently. What motivated you to speak on this topic? I have moved from Delhi to Dubai to Melbourne in the past 7 years. It has not been an easy transition, especially for my son. A lot of chats with my son and introspection led me to really think what's home? Where's home? See, I stayed in the same home from the day I was born to the day I got married. But my son, has moved three continents in the past 7 years and he's all of 9. He doesn't connect to India as he has hardly spent time there. He has grown-up in Dubai but he moved from there also. So where exactly is home for him? This motivated me to speak about the topic. So did you find any answers? Yes and no! My conclusion was simply, that he is the privilege one to choose a place he would like to call 'home' and where he thinks he 'feels at home'. The country on your passport or the place where your work or education makes you move is not necessarily 'home'. The book is to be launched soon. Fingers crossed! It's for children under the age of 6. It's a story about acceptance and warmth between unusual characters. An unlikely friendship in an unlikely scenario. The tale is told through animals and their point of view. Different themes, different situations will be envisaged in this series, showcased through the two central characters. In today's conflicting world when our acceptance of each other has really gone down, it's important without sounding preachy, to tell our children to accept others as they are. How do you manage you professional and personal life. I always try to keep my personal and professional life separate. Both have own entity and both are quite different from each other. I always try to put my whole soul to the moment, so if I am spending my time with my family, I never think for other. It's the same with my professional activity. 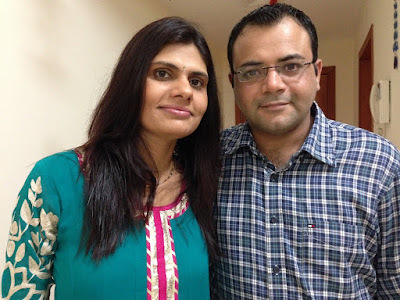 My Husband and Son both are very understandable person and they always help and stand with me. Can you share you message for women, who leave their professional life because of relocation or other reasons? The only thing I can say, from my experience, is that, change is inevitable - whether it is because of family, professional or personal reasons - just take life as it comes and introspect your strengths and your likes - you can always find a way to put those skills and interests to a professional world in the new place or new circumstances.